Editorial piece written by Grand Traverse Journal editors that opens each new edition. In the coming months, Traverse Area District Library (TADL) will become the home of the regional archives formerly maintained by the History Center of Traverse City (HCTC). In response to that event, reference librarians at TADL have received a number of questions. Since the Grand Traverse Journal is a forum for sharing knowledge, let me take the opportunity to describe an archives, explain its functions, and tell how having an archives available at TADL is important to library visitors and patrons. Afterwards the HCTC will supply a brief history of its archives. Archives are similar to libraries. They exist to make their collections of information available to people, but differ from libraries in both the types of materials they hold, and the way materials are accessed. 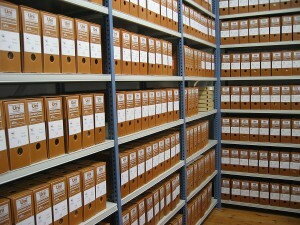 Archives concern themselves with future use, or the “second life” of information. 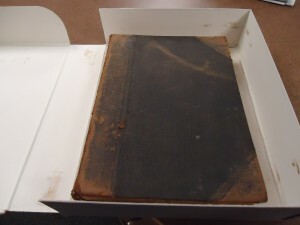 This book, held by the Kingsley Branch Library, is a 1913 county history, rehoused in a clam shell, archival-quality box. This book needs some conservation work; Once leather starts to “rust,” there is little that can be done. The rust Photo courtesy of the author. All information, whether it remains in your head or is recorded on a physical medium, has a first and second life. That life cycle can vary, depending on what the information is and how the information is used. The first life of information covers the time the information is immediately relevant, and the second life covers the time that information has no immediate relevancy, but may have some future use. Memorizing a restaurant phone number has a short first life, perhaps 20 seconds, and a long second life, where it may get filed in your memory bank for recall at some later date. Your birth certificate has a longer first life, as the information it records is good to have on hand for the length of your life, but it also has a second life. Perhaps a distant descendant will need that information to record in the family tree, or researchers will use your information to explore health issues of the past. An archives is a place to store, preserve, and make available information that is in its second life to people who need that information. Information held in an archives is usually unique. How does an archives function? 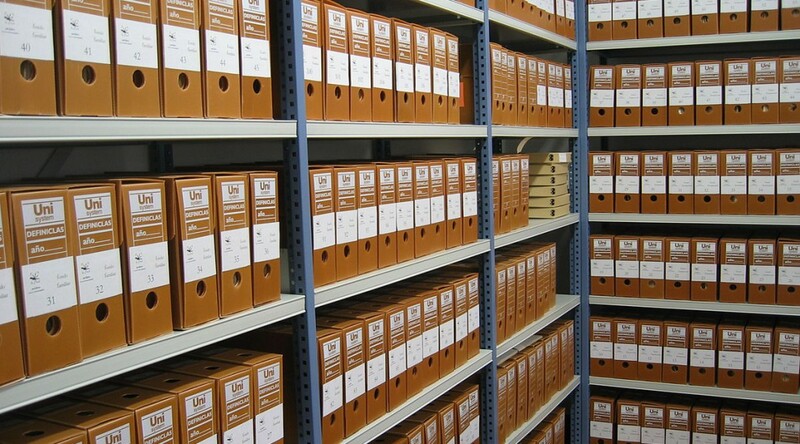 Most people keep their own personal records, such as tax filings, court papers, wills and trusts, and the organization and management of your personal archives is a thing easily managed. You create a finite set of papers, probably organizing them using folders and a filing cabinet or two, and within five minutes of searching, the document you are looking for is found. Shelved record boxes at an archive. Image courtesy of Depósito del Archivo de la Fundación Sierra-Pambley, through Wikimedia Commons. Now, imagine if you cared for all the personal records of every member of your extended family. You might need to come up with a system for making sure Aunt Joan’s documents stay with her other files, and Aunt Claire’s stays with hers. Most archives operate this way; We call it maintaining “provenance,” that is, keeping things of the same origin together. An alternative would be to separate like documents (perhaps putting everyone’s student loan information in one folder), but this method destroys the context of their creation, and limits our ability to arrange and describe the archives effectively. An even more amusing alternative is to throw it all in the middle of floor, but none of your family members would thank you for that. How could they ever find the document they were looking for? An object (usually a document, but it could be a bound volume (like a school yearbook) or a three-dimensional object, (like a rug beater from the 1910s)), is brought in to the archives by a donor (this person could be a staff member for an organization, a family member, or whoever is in possession of the object and deems it valuable enough to save). The object is appraised by the archivist (that is, the person running the archives). Archivists are looking for objects that add to our understanding of the past, and are not usually trained to appraise objects for their value. The appraisal process raises a number of questions: What does this object tell us about the past? Is it unique, or do I have a bunch of similar objects already? Is it in good condition, or is it very fragile and likely to take money and time performing conservation work? The object is accepted into the archives, or returned to the donor. If accepted, the archivist sits down with the donor and explains the Donor Form, in which the donor (typically) signs over their legal claim to the object. The Donor Form can also sign over other rights, permitting the archivist to provide access to the object, perform conservation work, and more. The object is processed into the collection. This is when the archivist catalogs and describes the object. That description is placed into a database of all the objects in the archives, so that researchers can search the database for objects that might have the information they are looking for. Finding aids are the most common tool created by archivists to help researchers find objects that meet their information needs. Finding aids are descriptive indexes, inventories or guides created during the processing of a collection to describe a collection’s contents. You can see examples of findings aids created by Traverse Area District Library to better understand how objects are processed: Finding Aids. The object is accessed by a researcher, and information is culled from it. After discovering the object in the database, the researcher informs the archivist that they would like to see it. For the security of the collection, the archivist will hold on to a piece of identification while the researcher is working. The researcher is also informed of the basic rules for handling archival materials, which includes using pencil only, not to write directly on materials, turning one page at a time, using gloves to handle photographs, and other rules as the situation calls for it. The archivist then pulls the object from its location, and the researcher is given time to look the material over and see if the information it contains answers their research question. 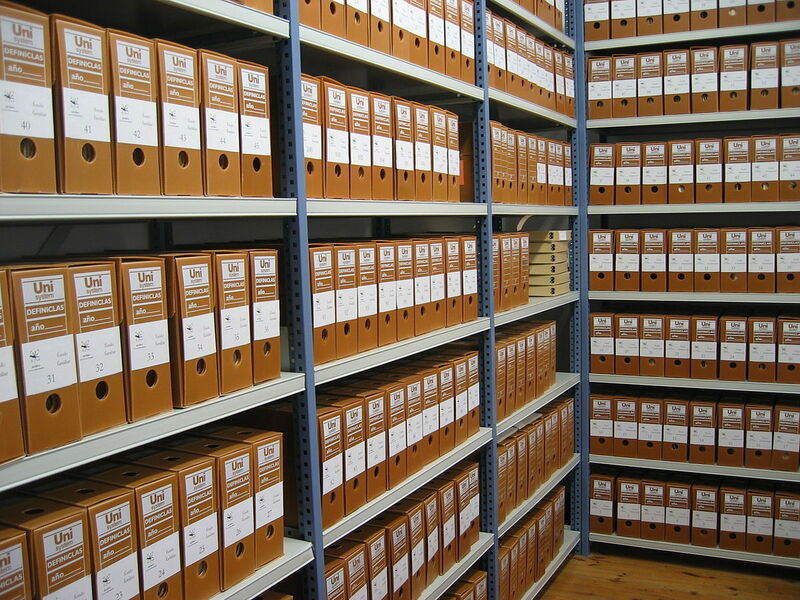 How will the transfer of the archives to TADL affect me? 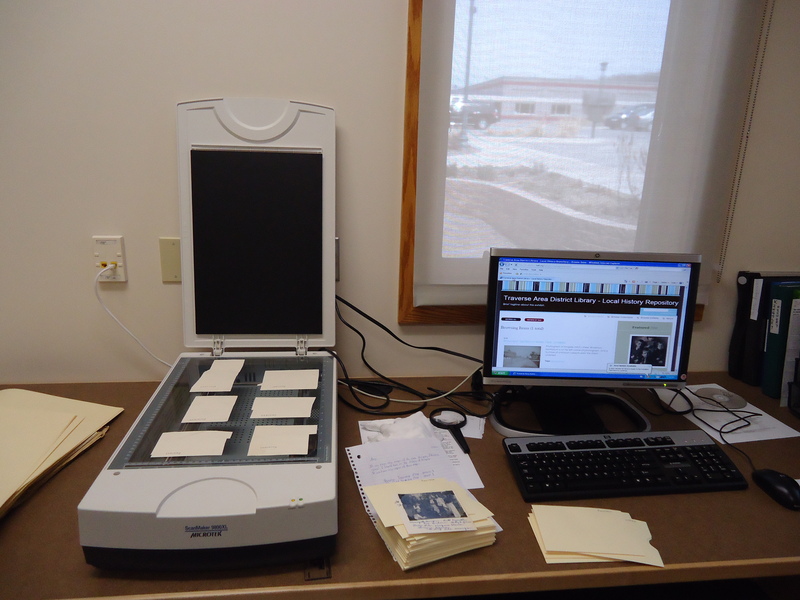 Scanning station at the Local History and Genealogy Room, Kingsley Branch Library. This is where the digital image magic happens. Photo courtesy of the author. As the steward of this public collection, the HCTC’s largely volunteer crew and lone professional archivist made the archives accessible, maintained the collections and improved them with new acquisitions. As the new steward, TADL is both professionally and technically prepared to take on the archives. In addition to those tasks listed above, TADL is also committed to growing and improving the online image archives as well, providing unparalleled access to both local and remote researchers. You can also expect the HCTC to stay involved and especially to promote history education for all. As stated by Stephen Sicilaino, Chair of the HCTC Board, “The Board believes that with the transfer of the archives to TADL, the History Center will be able to become a stronger organization and more effectively meet its mission to protect, preserve, and present the history of the region. We will continue to work with TADL on preserving the archives and we will have greater ability to present the history of the area through programs and publications” (Open letter to the membership, November 2015). Your editors hope you will join us for our HCTC and TADL jointly-sponsored monthly history programs, which take place on the third Sunday of the month, at 2pm. In 2016, topics will range from lumbering to labor strikes, and all points in between! The archives trace their beginnings to Traverse City’s Old Settler’s Association, a social club organized in the 1920’s, by the area’s original white settlers. This group eventually became the Grand Traverse Historical Society (GTHS) and focused primarily on social gatherings and educational presentations. In the 1980’s the GTHS joined with the Pioneer Study Center, a public archives started in 1978 at Pathfinder School. The new organization, the Grand Traverse Pioneer and Historical Society, received thousands of photographs and historical documents from the Pioneer Study Center. The collection was variously located in the basement of the Grand Traverse County Courthouse, the basement of the City-County Building, and above a store front on Front Street. In 2005 it moved into state-of-the-art facilities in the newly opened Grand Traverse Heritage Center, located at the renovated Carnegie Library building on Sixth street, the original Traverse City Public Library. The Society changed its name to the Traverse Area Historical Society in 2008. In 2010, the Society merged with another non-profit, the Friends of the Con Foster Museum, largely because the two organizations held similar missions, to foster historical education and preserve our local history, and the renovated Carnegie provided space for both the Museum collections, as well as the Archives. The combined organizations became the History Center of Traverse City. Since receiving the initial donation of the Pioneer Study Center archives in 1978, the organization (whatever name it was operating under) continued to collect donated materials to improve the archives’ holdings. Amy Barritt is co-editor of Grand Traverse Journal, and Special Collections Librarian at Traverse Area District Library. Special thanks to Peg Siciliano, who provided the history of the archives to date. With this very issue the Grand Traverse Journal marks its one-year anniversary. Like proud parents, the editors have watched the accomplishments of the foundling with much pride. It charmed us with Bill Scharf’s description of gulls on Gull Island; it confronted us with the truth about the so-called ghost of Bowers Harbor in Julie Schopieray’s October piece; it informed us how a frame church could be moved through the streets of Traverse City in the eighteen nineties thanks to Amy Barrit’s explanation in the November issue; it acquainted us with a new friend in Mud Turtle Jack, Valerie Himick’s remembrance of her grandfather. Thanks to the Journal, readers know about The Great Meteor of 1879, the history of local railroads, the first bus line in Traverse City, and the experiences of nurses, farmers, and veterans of World War II. Our Grand Traverse Journal has uncovered relics from the past: an old recipe book, a 1919 editorial decrying the abuses of the “5 percent,” an account of a midnight ride through the Peninsula in the nineteenth century, a poem written in 1890 that touches us with its description of Grand Traverse Bay in the language of the time. The Journal has exposed its readership to images of history all around us: images of an art-deco granite eagle on the Union Street post office, the profile of an Indian on a pump house on Front Street, the stretch of sidewalk at Clinch Park that honors the Anishnaabek presence in the Grand Traverse Area, a road marker emblazoned with the words Hamilton Way found at the Garfield Township hall just outside the city limits. We cannot count all of the articles writers have submitted, the feedback readers have submitted, the comments—all approving—we have heard regarding our one-year-old magazine. In response we wish to thank our supporters–in particular, all of the writers and readers who offered their time to make us a success. With your continued help, we look forward to another year of growth. 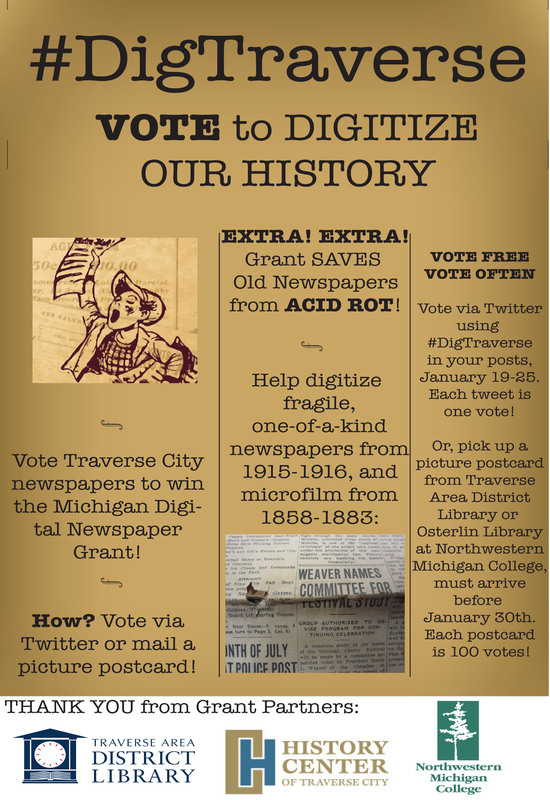 The Traverse Area District Library (TADL) along with local grant partners, the History Center of Traverse City and Osterlin Library, Northwestern Michigan College (NMC) are asking for community support to vote Traverse City newspapers to win the Michigan Digital Newspaper Grant. 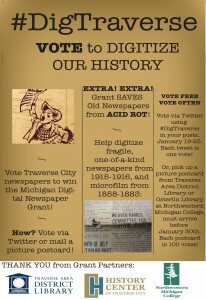 The community is encouraged to vote via twitter using #DigTraverse in posts from January 19-25. Each tweet equals one vote. Voting can also be done by sending a picture postcard to the Clarke Historical Library, Central Michigan University, Mount Pleasant, Mich., 48859. Postcards will be available at all TADL locations, the Osterlin Library at NMC, and the History Center. 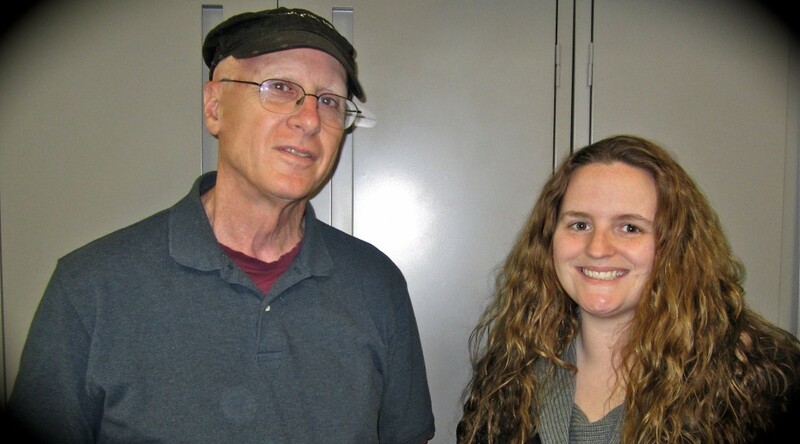 TADL and partners were selected as one of five finalists to receive a Michigan Digital Newspaper Grant administered through the Clarke Historical Library. The $2,500 grant award will help improve access to a winning Michigan newspaper. If Traverse City wins, the funds will be used for scanning and placing online nearly 10,000 combined pages of the Grand Traverse Herald, The Morning Record, The Evening Record, and the Traverse City Record­ Eagle. The grant would also cover microfilming and digitizing of fragile, one of a kind newspapers of the Traverse City Record-Eagle from May 1, 1915 to December 31, 1916. The newspapers being nominated were published pre­-1923, and are therefore in the public domain and cover a large geographic area including Northwestern Lower Peninsula of Michigan, with an emphasis on Grand Traverse, Leelanau, Benzie and Kalkaska Counties. Barritt said she and her grant partners are beyond excited to have made it this far and hope the community gets involved to digitize and preserve the region’s local history. “Our purpose in asking the public to determine the final outcome is so that, from five very good applications, the newspaper selected will serve the needs of the community that demonstrates the greatest interest in using the resource,” said Frank Boles Director, Clarke Historical Library. This project is made possible by funds from the Robert and Susan Clarke endowment, housed in the Clarke Historical Library, Central Michigan University. November is a windy month, some of its worst demonstrations giving rise to howling gales that sink ships and drive sensible people indoors to a warm fire. The wind also has a more benevolent side such as when it polishes and erodes pebbles on an isolated beach. Richard Fidler engages that topic in the Nature category in his article about lag gravels and ventifact fields. A lovely old poem about Grand Traverse Bay written by Mary K. Buck (1849-1901) tells about that body of water in any kind of weather. With its regular meter and rhyme, it strikes us as quaint, perhaps, but it displays a love for this place that resonates in our hearts still. Gini LeClaire faithfully recorded her grandmother’s memories about growing up near Silver Lake more than 110 years ago. Growing Up Wilhelm: Childhood Memories of Life on the Farm reminds us of the simple pleasures of rural living at a time when horses provided transportation and local crops the bulk of our food. While history can be recorded with pen and ink, nowadays it can also be told with digital techniques to preserve images and words. Amy Barritt shows how a tool called hashtag can be used to archive images for study and enjoyment. Find her article in Exploring History by Street and by Hashtags. Railroads cut into our awareness only occasionally when we hear an occasional whistle on the solitary line that extends to Traverse City. Not so a hundred years ago when the sounds of steam locomotives filled the air from Traverse City through Lake Ann to Manistee. Richard Leary paints a picture of the Manistee and North Eastern Railroad when it provided the main means of transportation for logs, crops, and human passengers. His article, Remembering the Golden Age of Railroads: The Manistee and North Eastern and its Traverse City Connections, can be found in the History category. This month’s mystery picture reminds us that history does not have to be “old” to reflect an earlier time. See if you can recognize the neon sign in the lower floor of a local business. Search as you will, nowadays you won’t find what it advertises. And if the sculpture pictured in last month’s Journal puzzled you, find out where it is below. How did they move a large frame church building in the 19th century at a time before wide-load rigs and hydraulic jacks? Through historic photographs and careful research Amy Barritt examines this question in her piece, When Horsepower Was Literal: Moving Buildings in the 1890s. Although the entire building is no longer present, remnant pieces and design features still remain in the Episcopal Church at the corner of Boardman and Washington Streets. A wonderful description of another 19th century activity, day trips by horse-and-buggy, exists in Martha E. Cram Bates’ account of an August journey she made along Old Mission Peninsula, To Traverse Point and Return. Far from being a “day trip”, she began her adventure at 5:00 P.M. and returned well after midnight, telling us about a glorious sunset, the passing farms, the crashing Bay, and the moonlit ride home. The tale provides a contrast to our harried trips out to see the Old Mission lighthouse, all done in the space of an afternoon within the cabins of air-conditioned automobiles. Annie Spence visits a public beach in Elk Rapids with her infant son, reflecting upon Nature, parenthood, and an unspoiled place close to her home in her essay, The Tonic of Wildness. If you listen carefully, you can hear the voice of Henry David Thoreau in the crash of the surf. One plant she might have trampled on is the humble horsetail or snake grass. Its tough jointed stems and deep roots may frustrate those who wish a bare sandy beach, but it has its virtues–as Richard Fidler tells us in the Nature category. Mud Turtle Jack is not about a reptile, but about Valerie Himick’s discovery of a box of poems written by her grandfather many years ago. She was astounded by the work of a man she scarcely knew, a man who expressed his love for the Great Lakes—especially the area around Frankfort–in a lifetime of writing poetry. We include a generous selection of his poems along with commentary by his granddaughter. Readers may elect to read the entire piece by clicking at the end of the article, which may be found in the Celebrating the People section. Finally, another mystery photo confronts us, this one a mosaic in front of a downtown business on Front Street in Traverse City. Can you name the business that now occupies the place? Can you tell anything about the business that existed there a hundred years ago? Email us if you can, share what you wish on social media—and keep sending us photos and articles for the Grand Traverse Journal! This month we offer a mystery solved: Hannah St. Mary’s: A Treasure. Written by thirteen year-old Hannah Carr, one of the winners of the Floyd Webster Teen Prize, 2014, it exemplifies the kind of work we welcome here at the Journal, an authentic telling of a historical event long forgotten. The piece also exemplifies the authors we want to hear from: writers with curiosity and a passion for research. Have you ever wondered about those yellow signs informing drivers that a fire station is nearby—or a playground, or a deer crossing? Who designed and approved them? Just when did they appear along highways? Why do they reflect such antiquated pictures of fire trucks and tractors? You will find answers to your questions in Windows to Our Past: Warning Signs Along Small Roadways, an article in our “Then and Now” section. Speaking of other things we take for granted, what are those pimple-like things you see on maple leaves this time of year? You may be surprised to learn they house creatures far smaller than the head of a pin. Check them out in Growing Your Own House: The Mites of Maple Bladder Galls in Nature. Traverse City is a town of festivals: the Cherry Festival, the Film Festival, the Comedy Festival, and more to come, no doubt. 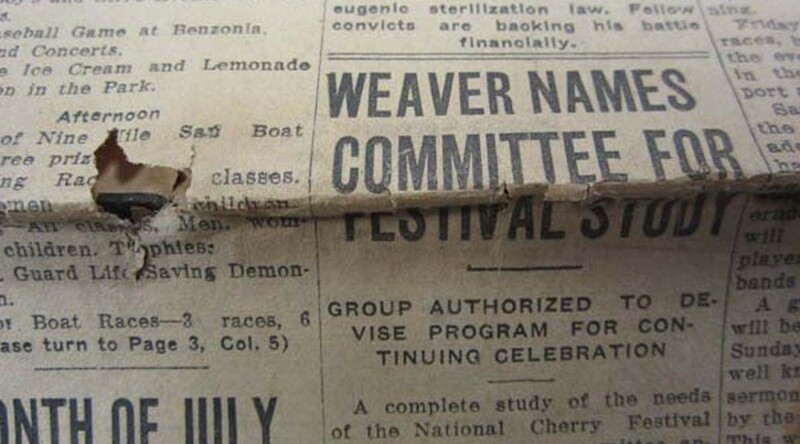 In August, 1911, Traverse City celebrated—itself!—in a grand festival. “Farmers came with their families, and city folk, too. The rich and poor mingled. Young and old. Factory workers and their bosses.” All came out for a picnic at the present Civic Center. There, among all other entertainments, a speech greatly relevant to our modern world was given. Read about it in Traverse City Day. One of those picnickers might have come from Almira Township, Benzie County. Read about the founding mothers and fathers of that place in Richard Leary’s Earliest Settlers of Almira Township under “Celebrating the People”. We hope others will tell us about their explorations of local history. Finally, the Mystery Photo, the answer to last month’s and the challenge of this month. A reader correctly identified the location of last month’s after hours deposit box, as you will discover if you peek in that section. Now a granite eagle confronts readers. Where is it? We greet you! After a long vacation, we resume the composing stick and quill, a calling in which we have spent the happiest and best portion of a life now past its meridian. We present you to-day the first number of the GRAND TRAVERSE HERALD. It is modest and unpretending in size,–perhaps some may think too much so,–but remember it is only one day old! It will have time enough to grow, and will expand its dimensions just in proportion to the nourishment it receives. In typographical appearance, we think it will compare favorably with any paper in the State. At all events, we have consulted our own taste in that matter, and are satisfied with the result. So begins Morgan Bates’ first editorial for the Traverse area’s first newspaper. Not holding composing stick and quill, we struggle with hardware and software, though perhaps not as Bates would have imagined those things in 1858. Whatever the differences in composition and production, we do share his enthusiasm and his high expectations that something interesting and new is in the offing—for us, THE GRAND TRAVERSE JOURNAL (GTJ). GTJ tells of Nature and History, always with an emphasis on the Grand Traverse region. Every month we will support that focus through regular department features, photographs, and articles written not just by us, but by you–our readers–who will share your experiences, articles, and photographs with hundreds of your fellow citizens. Alas, we cannot pay you for your trouble—after all, we are supported by two nonprofits, the Traverse Area District Library and the History Center of Traverse City—but we can inform an entire community about who you are, what you are interested in, and what projects you are involved in. Please look at the Submissions Guidelines, which spells out what we are looking for. As Morgan Bates said, our magazine will expand (and improve!) just in proportion to the nourishment it receives. You, the readers and soon-to-be writers, will supply the nourishment required for the Grand Traverse Journal to grow. The Grand Traverse Journal may be viewed at gtjournal.tadl.org. In addition, paper copies may be obtained at the Reference Desk of the Traverse Area District Library and at the Archives of the History Center of Traverse City. Readers may make copies of articles for the cost of reproduction.